Despite visiting this wonderful city already aged 18, my memories of it have become somewhat hazy over the years. So when my friend chose Madrid as the setting for her hen do, I was excited to get to explore it again and refresh my memories of a decade earlier. So even though we were only in the city for one full day, I thought I’d do a little blog post on the highlights of our gals mini break – which both my head and stomach muscles are still recovering from. This was about as much on point as my alliteration efforts. Honestly, I know it’s said often but sometimes the small, simple things really are just the best. Exploring and doing that walking thing is fine and everything but really, sometimes you just cannot beat cold sangria, awesome friends – old and new! 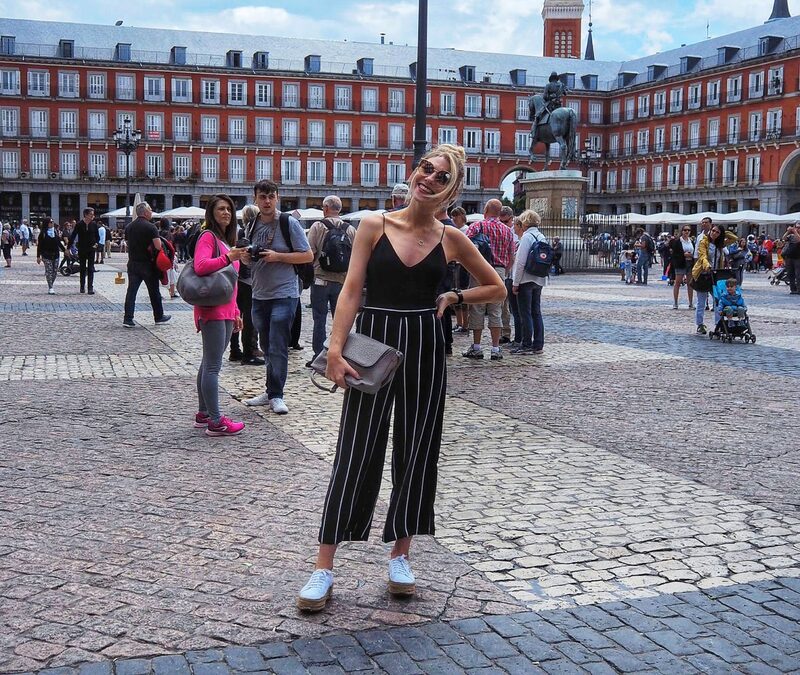 – sunshine and people watching in the beautiful Plaza Mayor square. It’s surprisingly difficult sometimes to secure that dreamy recipe of good food, good company and good surroundings. But our second night in Madrid impressively nailed all three. We feasted on tapas delights which included (from what I remember) battered and fried courgette, chorizo of an actual butter-like consistency (don’t ask me the name), ham croquettes, Spanish tortilla, calamari and many many many other dishes. Despite neither party’s ability to speak the other’s language, the waiters were absolutely hilarious. The manager provided us with fizz and a variety of liqueurs on the house before conducting an impromptu lock-in until after midnight when we moved onto our next venue (see below!). If you’re ever in Madrid and want great food, friendly staff, authentic Spanish surroundings and – importantly – very reasonable priced and tasty Shiraz, would highly recommend El Anciano Rey de los Vinos. Being from Scotland, rooftop terrace bars will never lose their novelty. Being able to drink outside at night and not shiver your tatas off? Yes please. We headed to El Viajero and drunk gin, talked nonsense, made videos for my friend’s fiance to drunkenly express our gratitude to him for buying us the first round of drinks and generally had an absolutely excellent time. 10/10, would recommend. And finally… all the cheese. Ok so this isn’t a PARTICULAR anomaly for me but I do feel that the quality of the Madrid manchego was bloody amazing – to the point that the various blocks of cheese we bought at the local mercado served 8 of us for pre-dinner snacks, after-club munchies and breakfast both days. And there was some left over when we left. Because everyone knows if you’re abroad, “clean eating” can actually gtf. So even though we arrived Friday evening and left Sunday morning, I felt like even this brief re-encounter with this beautiful city, its beautiful food and all the beautiful girls I was with made it one of the best weekends I’ve had in a ridiculously long time. Gracias, Madrid! The stretch between December and March/April can seem fairly eternal. With the excitement of Christmas behind us, the next cause for celebration is the distant promise of leaves on trees, the long Easter weekend and the ability to gorge shamelessly on chocolate eggs. SO, this is precisely why it’s the perfect time to book a getaway and give yourself a little sumpn sumpn to look forward to and ease those Q1 blues. 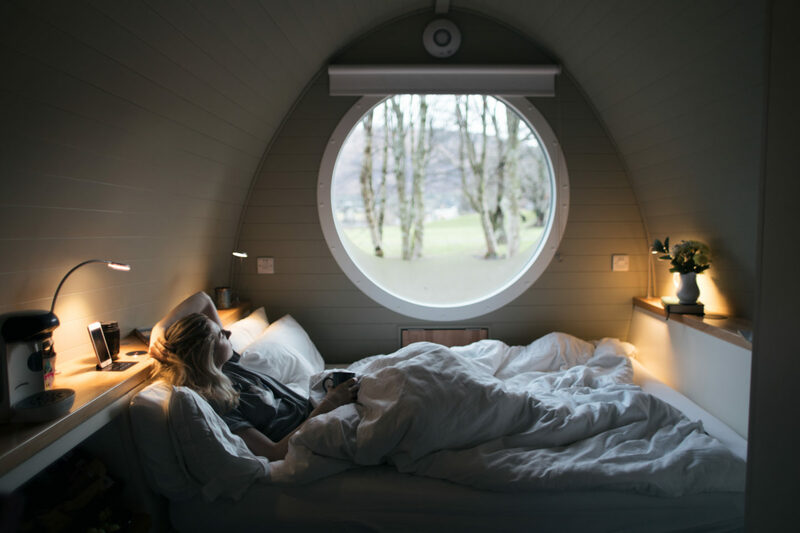 It was in this spirit that KK and I embarked on our little road trip up north for a stay at the Riverbed Lodges in Glencoe. Glencoe is one of those places you drive through and each time feel completely in awe of your surroundings. From Edinburgh it took us about 3 hours to get there, but the drive is often heralded as one of the most beautiful roads in the UK, making it about 50 times more enjoyable than your average 3 hour shlep. You arrive up a little track road and see the lodges nestled among the trees, each with their own little set of steps and veranda. There are 8 of them in total, seven of them with a hot tub and one without. They’re 12 sqm so totally teeny, but so cute and cosy. The first thing we did was get into our comfies, take some photos and just chill out which was so nice and relaxing. 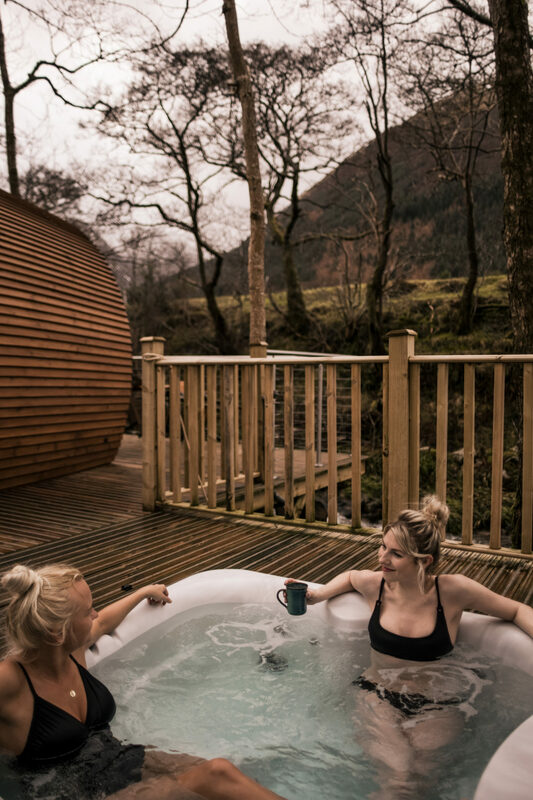 I’d be wholly behind getting a lodge with a hot tub because as far as I’m concerned there’s very little better than climbing into one on a cold day, armed with a bottle of chilled prosecco. It was pretty much an example of us living our best lives. No it’s not a floating black bikini – if you look closely there is in fact a very translucent bod in it. It got dark pretty quickly by the time we climbed in so we don’t have many photos of it from the first night, but rest assured that bad boy is just as great to relax in come morning with a cup of cawfee from the lodge’s nespresso machine (ugh can I just live there already). 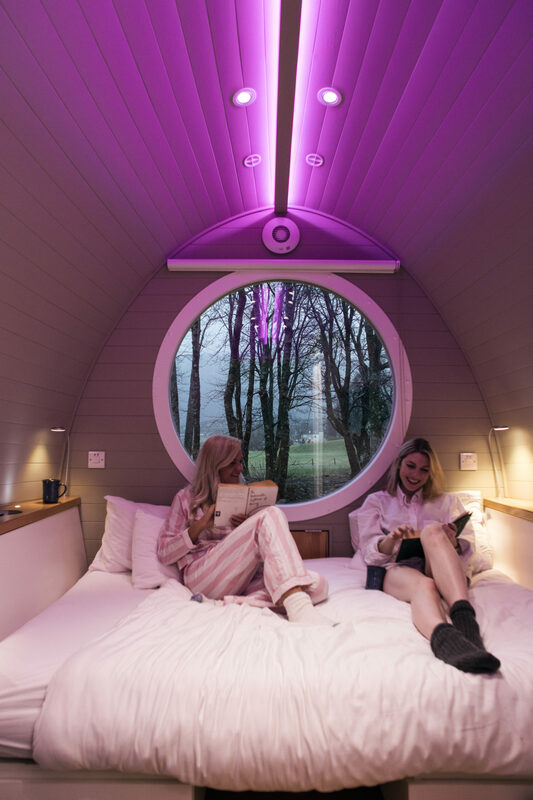 We chose to spend our time there hanging around in either our pyjamas or in the hot tub, because quite frankly we were there to laze around, but if you wanted to actually branch out of your lodge there’s loads of stuff to do – including hill walking, skiing at the Glencoe range nearby, Segway tours, cycling, mountain biking and golfing.  There are a few local restaurants you can check out too. 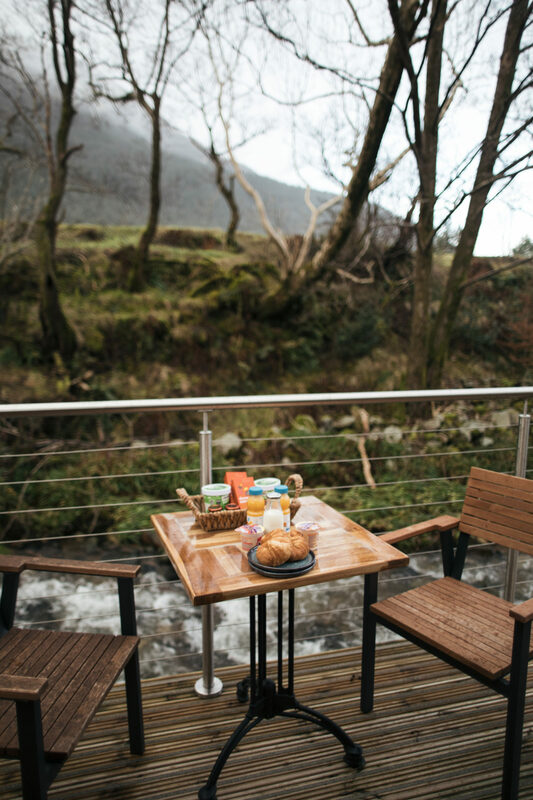 Included in the stay is breakfast, which includes granola, porridge, fresh milk, orange juice, croissants (with butter and pots of jam) and fruit. 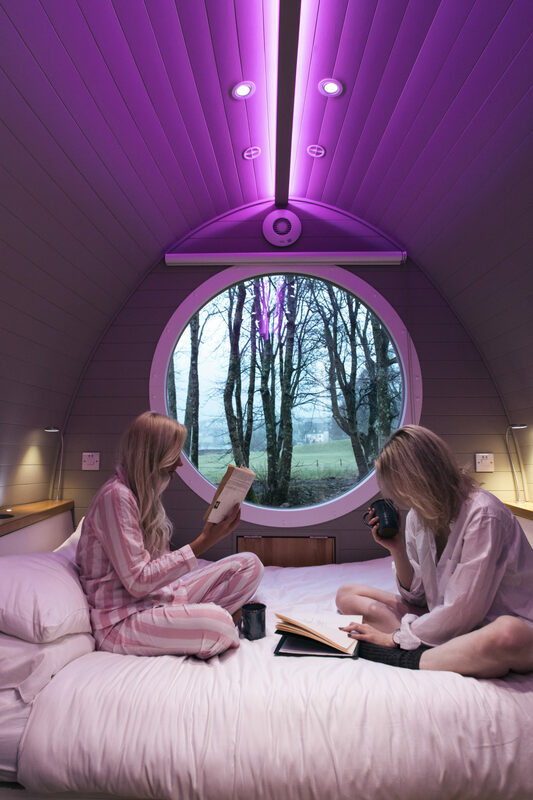 The bed frame folds into a little table you can eat it at or if it’s dry outside, you can have it out on the veranda – pre or post morning hot tub dip! Whatever you choose to do there, you won’t be disappointed by the lodges and their surroundings. It was such a novelty staying right amongst the trees and mountains but in the safety of a warm little lodge haven. They’re a perfect weekend getaway for a group of pals or your other half. 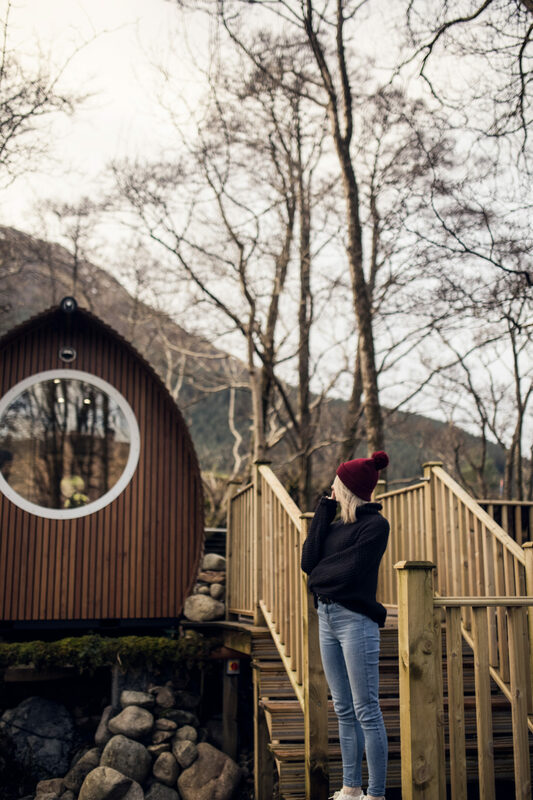 If you’re thinking of booking a stay at the RiverBeds, make sure to use the code ‘kkland’ so you can enjoy prosecco, chocolates and bath robes included in your lodge. So, in negligence of the fact we’re meant to be saving, my inner travelista remains a force to be reckoned with. And off to Praha I flew last Sunday. Yes it’s an obvious one, but missing this out on a trip to Prague would be pretty sacrilegious. 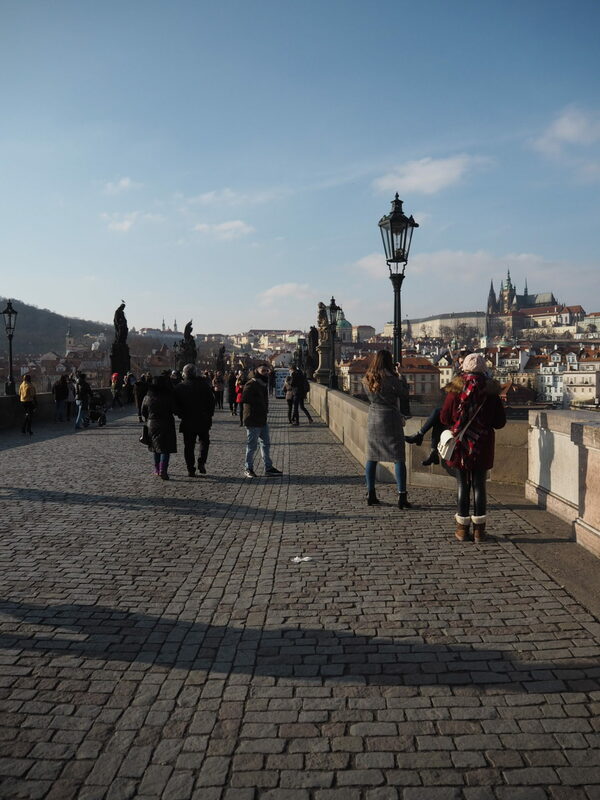 The bridge itself provides a glimpse into medieval Prague (pre-cartoonists and postcard vendors, obv) and there’s nothing like a bit of history on your holidays to make you feel cultured. 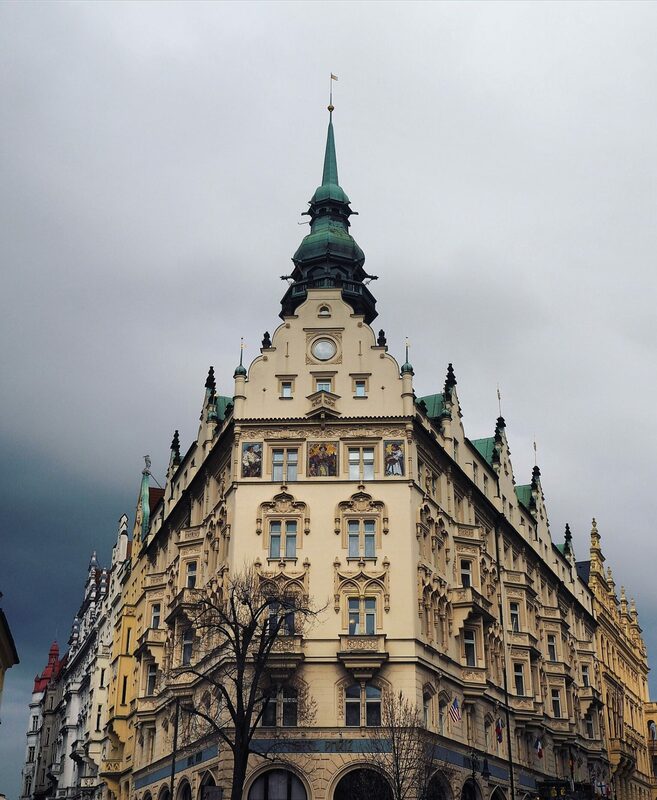 It connects Prague’s old and new towns and is just a lovely space to wander around. Leading onto the Old Town’s gorgeous old cobbled streets, which are lined with old beer houses, squares and medieval buildings, the piece de resistance is the multitude of bakeries selling Trdelniks – or ‘Chimney Cakes’. Oh god the Chimney cakes. Round pastries coated in butter, rolled with cinnamon sugar and almond and filled with nutella, jam, ice cream or fruit, trdelniks are everywhere in Prague and were the sweet lining to my hol. If you want to feel like Daisy Buchanan for the night, this is ya place. I’m a total sucker for anything novelty/vintage/retro – anything that reflects a different time period, basically. 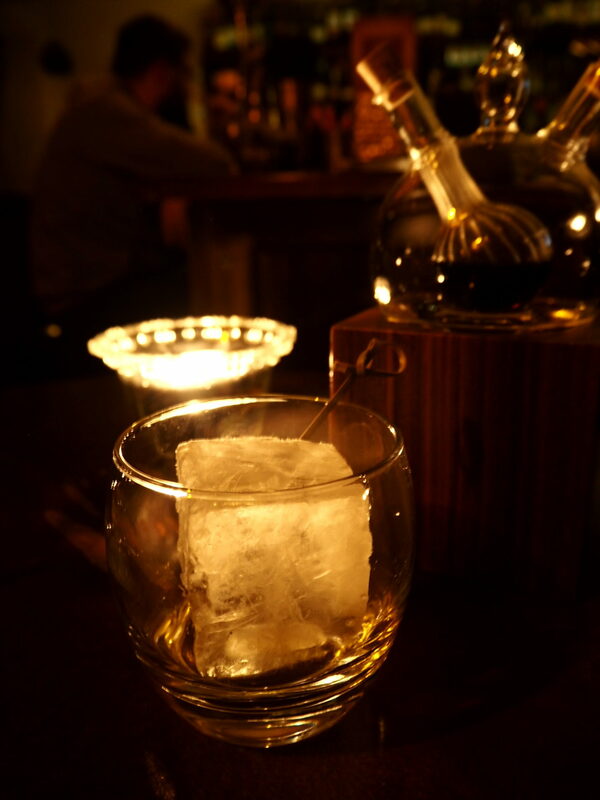 So when I heard about this little speakeasy tucked among the cobbled streets of the Old Town near the river Vltava, I took little persuading to go in and sample a cocktail or two. Entering through a thick, velvet curtain, you’re led into a small, candlelit bar. There’s classical music playing and the waiters wear bow ties. The cocktail list is immense, and the drinks are served in a variety of oddball container. I had the “Magic Moment” cocktail of Beefeater gin, mallow and nettle cordial. “Part of the magic is made by you” the bartender told me (flirt), before presenting me with an odd looking little potion bottle with 2 different openings. You mix the gin and then the cordial and the drink changes colour, which provides a lot of excitement for a simple gal like me – especially after a couple of wines already. It also tasted pretty dang delicious. I could’ve inhaled any of the cocktails on their list – peruse it for yourself here. Oh and just in case you require any further persuasion, Hemingway Bar has been listed as one of the top 50 best bars in the world. In short, you gots to go. We heard about this art deco place through my dear old dad as a jazzy little spot for lunch or dinner so we thought we’d check it out. With over a century’s history behind it as one of Prague’s best-loved restaurants, I knew we’d be in for a bit of a treat. I didn’t get any photos of the inside (one food pic on my phone was already pushing the bf’s limits), but the ornate ceiling, golden intricacies of detail and bow-tied waiters (do I have an underlying fetish for this?) made for a very luxurious restaurant experience. 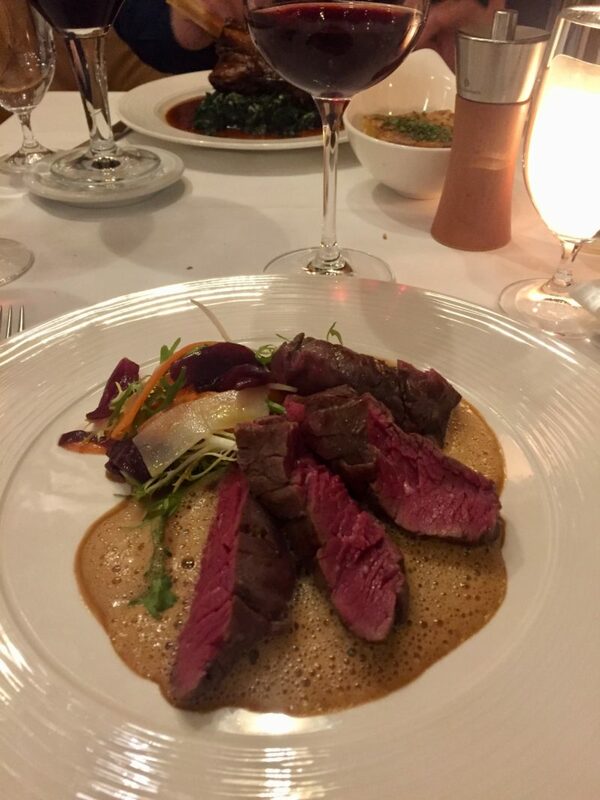 I had a “US Hanger” steak – nope, not entirely sure what it is either, but I can tell you it was unbelievable! Good house red wine too. 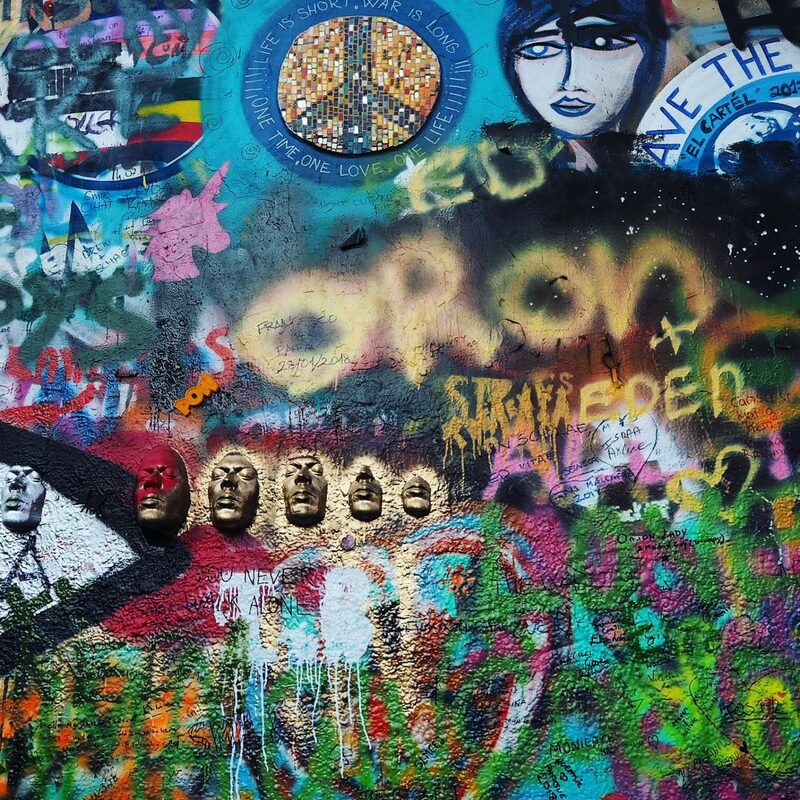 Who knew the Czechs held such an affinity with the Beatles’ bespectacled lead singer? 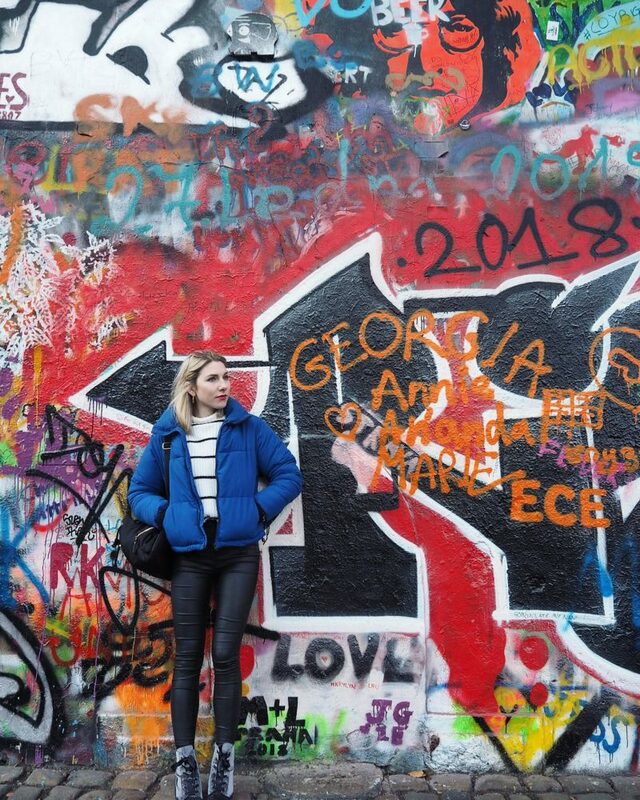 On the other side of the Charles bridge, into the Old Town, there’s a whole graffitied wall which serves both as a shrine to JL and a canvas for the city’s enthusiastic spray-painters. Random to us, yes, but apparently after his death, the music icon became a pacifist hero for oppressed young Czechs living under communist rule. It’s a mish-mash of JL imagery and the words he stood for – peace, love… also now ‘beer’, which you can see emblazoned on his forehead – but the common theme that belies it all is one of inspiration and political freedom. It’s a pretty cool place to visit. 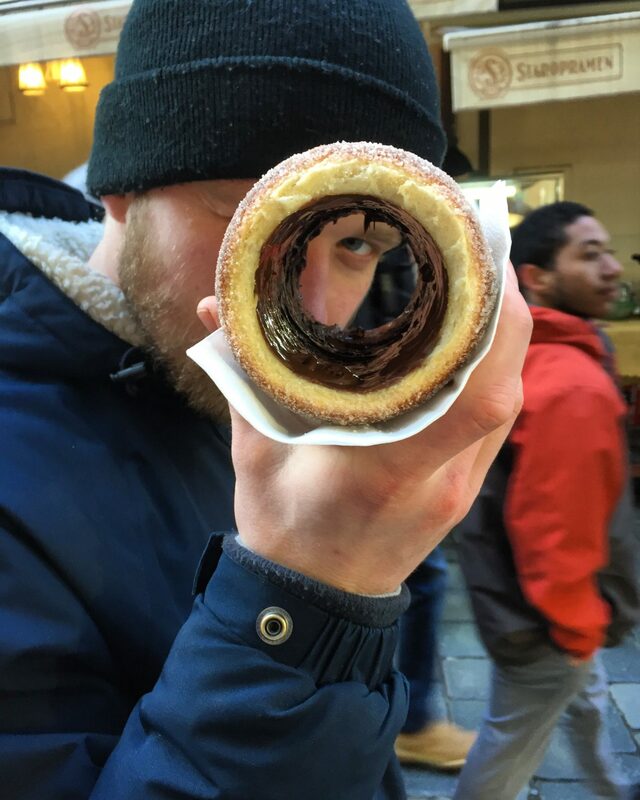 It’s also really close to the Trdelnik street I mentioned earlier. Want to be where the [Czech] people are? Then this is ya boy. 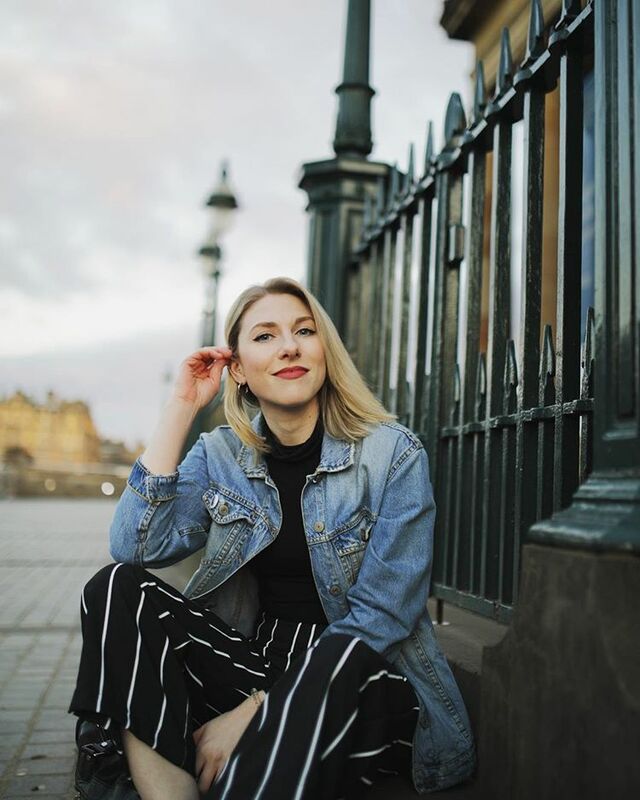 A friend of ours who lived in Prague for 6 months told us about this place and it was just as she described – lively, full of young locals and with a gigantic list of different craft and local beers and wines, I felt like this one one of our more ‘authentic’ Prague experiences. We got probably the most lethal “Grog” I’d ever tasted – as in, probably could’ve got drunk from the fumes alone – and a pint of raspberry beer which was (dangerously) tasty. There’s an array of local food as well, i.e., potato dumplings and sausages, but we were content with our novelty bevvies. Great little spot for day or night drinking (I don’t discriminate), and probably your best bet to sample some of what the Prague locals eat and drink. So it seems the Czechs love beer so much they bathe in it. After a heavy night but with a determined “when in…” attitude, we marched to the nearest available spa. Mainly for the lols, if I’m honest. And lols it did bring. We were led into our own private spa room with two deep, wooden baths at one end. These were filled with hot water and a mixture of malt and hops. In the corner there was a little fire and a “traditional hay bed” (no we didn’t really know what that was about either). When our host eventually left and we had recovered from our laughing fits, climbing into a bubbly bath of beer with access to an unlimited beer tap next to you proved to be one hell of a way to spend an afternoon. And yes we eyed each other cynically when the host started talking about the benefits of malt and hops on your skin, but I gotta say we were softer than a couple of peachy baby bums after that sesh. With the added benefit of finely sculpted abs from laughing for an hour straight…. It’s a city I’ve now experienced in both summer and winter and both times it’s been equally as beautiful – and very good fun. 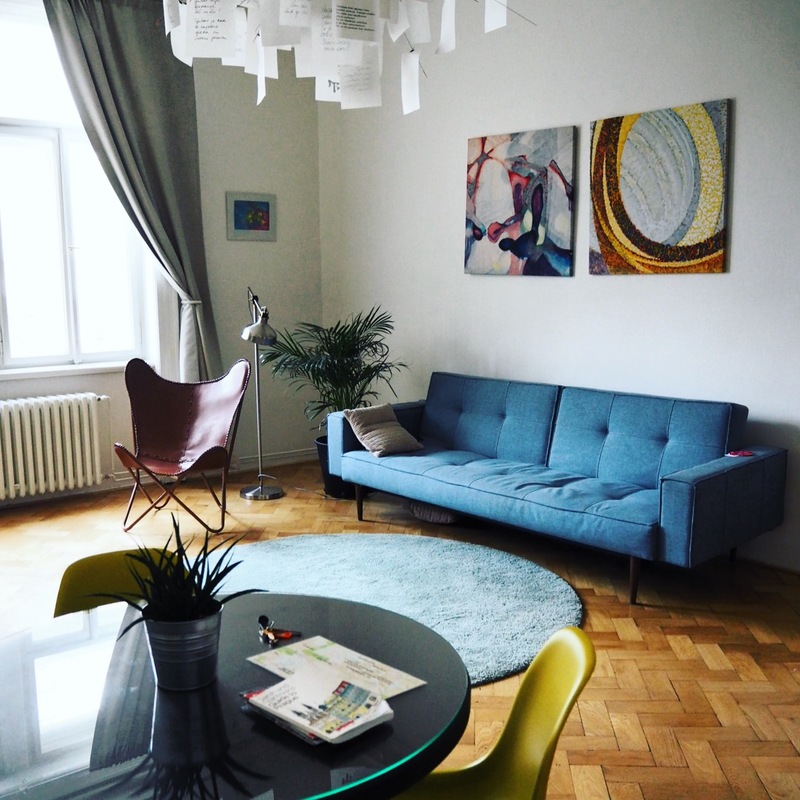 If you visit, there’s no other way for me than an air bnb – we got this beauty for £23 a night. Praha, I’ll be back again some day. 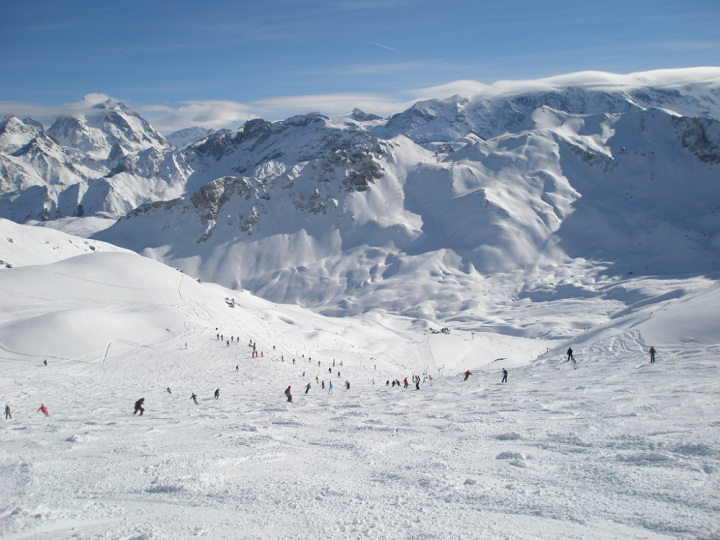 After holidays like last week’s, the return to real life joins wrinkles, alarm clocks and hangovers in the realm of the violently unwelcome inevitables. ’60s architecture, bouncing rain and a stray ginger cat staring gloomily out from underneath a nearby tree are the main components making up my current vision. I am also in all seriousness wearing my jacket inside as the office is a wee bit chilly. I could do with a cup of tea but they only have espresso machines here. There are also a lot of vowel sounds floating about, lax working hours and a suspicious amount of male ponytails. If it wasn’t for those select clues probably neither of us would realise I am in fact in Italy. And so it is that I find myself embarking on a 3 month long internship in the Communications Department of the European Training Foundation, based in Turin, Italy. A decentralised agency of the European Union, the ETF works with 30 partner countries, ranging from Albania to Tajikistan and beyond, helping to harness the potential of human capital in developing or transitional countries, through reforms such as Vocational Education and Training (VET) and ‘skills matching’ research and workshops. That all sounds quite important, but as a Comms Intern it is my general job to post regular updates on social media, write follow-up news articles for the website and generally attempt to engage with the public in a way which is, er, engaging. Hopefully. Although I am glad to be here, working a job which is actually relevant to my English and Journalism degrees, I currently gain most of my daily entertainment from the buses I have to catch to get to work. The first – a number 52 – from the nearest main street to me, Corso Vittorio Emmanuele II, is relatively civil. Aside from the old man who occasionally rides it, who has his own vacant smile accompanied by a vague whiff of urine which ensures him a metre wide radius, most of the people are commuting to work (maybe he is too, and just wanted to ensure spacial luxury, we will never know, because I do not speak Italian yet). Either way he seems quite happy so all is well. I then change buses down at the River Po, where I wait patiently for the number 73 (it doesn’t seem to have a fixed time it arrives, and much like any Italian body, whenever the hell it wants; a difficult concept for my British brain to cope with at first but I have come to accept this state of affairs.) When the 73 eventually approaches, I imagine it to be the autobus version of the skinny freckled kid who was picked on in the playground. Half the size of a normal bus – potentially, in fact, the smallest ‘functioning’ bus I have seen in some time, if perhaps ever – the 73 whizzes into view round the junction, before coughing and wheezing its asthmatic way towards its gathering of patient passengers-to-be. At our own peril. We all squeeze on and stand in the aisle. The challenge to stay vertical is rather a tough one aboard the number 73. Most of the poles designed to help you stay upright would I believe carry out the opposite effect. Half unscrewed from the ceiling or ground and wobbling dangerously when touched, the brave number 73 commuters generally attempt to grasp bus seats or walls for leverage while the bus crawls up the hill. Sometimes in the middle of the journey the back doors burst open but of course us seasoned passengers don’t even blink now when confronted with fast moving concrete inches from our dubious footing. Only the other day the bus engine refused to restart after allowing a passenger off at one of the uphill stops, and we began rolling backwards down the hill, to which the driver bellowed for us to PREGARE PER LE VOSTRE ANIME. PRAY FOR YOUR SOULS! To the majority of you this probably sounds like somewhat of a traumatic morning commute but I think in its own little way it may be one of my favourites yet. More Italiano updates to come soon, after I have done some token afternoon writing for the work blog, rather than my own… Ciao, e parlare presto!